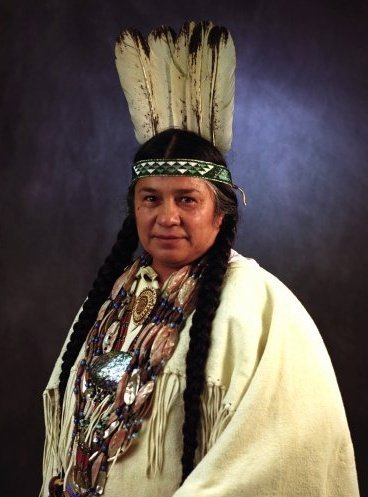 Chief Caleen Sisk, traditional and spiritual leader of the Winnemem Wintu tribe of the McCloud River watershed in Northern California, will give a keynote speech during a salmon dinner celebration at the Many Nations Longhouse on Friday, Jan. 25. She has been visiting the University of Oregon campus since Wednesday. The Friday dinner is from 5 p.m. to 8 p.m. and is free for students and the community. Sisk appears as part of the Lylle B. Parker Woman of Color Speaker Series hosted by the ASUO Women’s Center. Her Friday talk is co-sponsored by the UO Multicultural Center, Environmental Studies Dept., Native American Student Union Café Mam and the ASUO. Sisk has been on campus this week to discuss indigenous peoples’ rights, women’s rights and the environment. She has a background as an educator and serves as the spiritual and environmental commissioner for ENLACE Continental, an international network of indigenous women and is active within the United Nations Permanent Forum on Indigenous Issues. The Winnemem Wintu tribe has been involved in a struggle to regain its federally recognized status, to have its religious rights protected and to restore its local salmon runs in Northern California's McCloud River. The construction of Shasta Dam in the 1940s dislocated the Winnemen Wintu and threatened the salmon runs. An effort is now underway to raise the dam an additional 18 feet, which would flood 39 sites along the McCloud River that the tribe considers sacred. The tribe maintains it would bring an end to the Winnemem people’s ability to practice their culture and religion, and pose further dangers to salmon. Event organizer Jessica Rojas, who is the ASUO Women’s Center’s diversity coordinator and is studying environmental studies and ethnic studies, says the Women of Color Speaker Series (formerly Women’s Diversity Speakers Bureau) has evolved to include big names such as Angela Davis and Yellow Rage, and has now broadened to work with local activists and academics around issues of gender and race. Rojas wants people to have an understanding of the diverse race, class and gender issues that surround land and water use and to learn what issues stand in the way of restoring salmon or of a tribe being federally recognized. The food is local and the people preparing it are local women of color. “As a feminist, I want to make sure folks understand what it means to support women of color, on campus and abroad,” Rojas says.